For the last 15 plus years our Northern Virginia Power Washing Company has been cleaning and staining decks to restore their natural beauty and providing a clean safe outdoor space for people to enjoy. That level of experience has helped us perfect our techniques for new wood decks or older decks with brittle wood that need restoration. We can also strip deck boards of old stain safely for a color change. The cleaning materials we use will help to breakup dirt, grease, mold, and any other harmful contaminates that are growing on your decking materials without damaging it. Our House Power Washing team has washed the exterior of single family homes and townhouses from Manassas and Gainesville to Ashburn and Leesburg Virginia. We use safe low pressure techniques to prevent damage to your exterior siding. 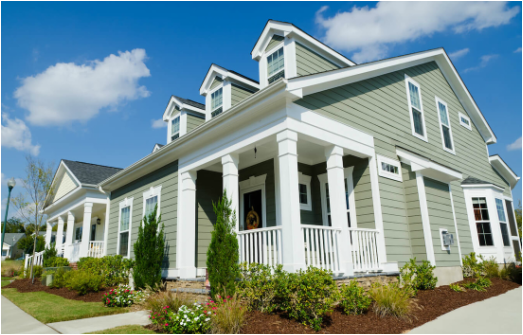 Our team members will start with a visual inspection of your homes exterior to make sure your siding hasn't pulled away from the house and created a large gap allowing water damage. The cleaning materials we use are tough enough to loosen up dirt, dry caked on pollen and mold without damaging the exterior of your house. Having a professional roof cleaning company wash your roof is a popular way to revitalize the exterior of your home. Because of NOVA’s location near water we have a high level of humidity even when compared to some other states in the south. This humidity helps causes Algae and Mold to grow on your roof shingles and create those black streaks. Overtime they will grow and attached to your shingles. Our company uses roof cleaners that are recommend by the manufactures for cleaning roof singles by killing Algae, Lichen, and mold so the black streaks don’t come back only a few months after we clean it. Gutter Cleaning is an important part of your yearly maintenance to protect your home by guiding water away from your Exterior Walls and Foundation. Sadly it is also one of the most overlooked areas of maintenance that can lead to major damage and costly repairs to your Roof, Fascia Boards, and Basement Walls. Our crews have experience cleaning a wide verity of rain gutter systems for single family homes and townhouses with gutters no taller than 2 stories. We start booking appointments for our gutter cleaning services in September. We have perfected our rust stain removal formula over the last decade for Roof Cleaning, House Washing and many other exterior surfaces that have rust stains. Our cleaning solution mixture will remove the stains completely without discoloring the treated area. Many other companies will simply buy the harshest chemicals they can find to remove the rust and leave new stains on your roof and siding. Rust can come from many different places like pipe collars around vents, Skylights or exposed nails that aren’t galvanized. The rust stains on your house usually come from exposed metal at the edges of you roof, attic vents or from vents sticking through your siding such as your dryer exhaust. It doesn’t take a lot for rust to form all you need is iron, oxygen and moisture. The moister can come from multiple sources like direct water from rain or moisture in the air from the humidity. Composite Decks and Fences don’t require as much work as a wood deck and fence but they still need to be cleaned. The composite plastics that they use have a porous surface that can collect dirt, mold, oil and grease. 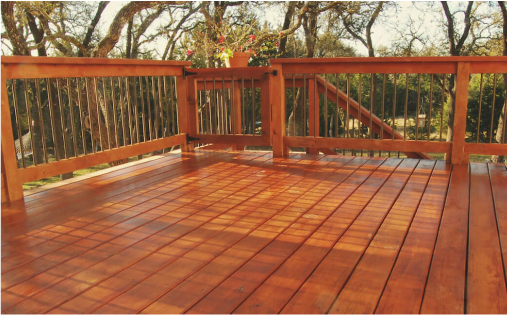 Leafs can also add stains to your deck boards when wet leafs are left sitting for an extended period of time. Cleaning some stains requires experience working on a variety of different colors texture and ages of composite decks to use the correct equipment and mixture of chemicals to remove the stains without damaging the composite plastic materials or stripping the color.